A window and door manufacturer recently improved efficiency and ergonomics in its manufacturing facility by using long, motorized lift table carts as part of an innovative material handling and production solution. The project not only utilized custom motorized carts, but also modified material handling methods to create safer, more efficient parts processing. The facility needed to increase capacity of its production process. Moving and storing 16-ft.-long parts was cumbersome. Parts stored in 16-ft.-long bins were pushed on the floor with a forklift to an area where an overhead crane was used to stack the bins in a storage area. When parts were needed for production, an operator loaded a batch onto a long-length manual cart that was tugged to the production area where it was maneuvered manually for final positioning. A manually operated cart with payload could weigh over 2,500 lbs., exceeding the company’s push/pull force restrictions for avoiding injury. As part of the solution, the parts storage method was redesigned. Bins with parts are now stored on raised bunks and located directly across an aisle from the fabrication cell, rather than a long distance away. In addition, new 13.4-ft.-long custom motorized carts were designed with a lift table which can be raised slightly to lift the storage bunk for transport. The cart with the bunk containing parts is backed into the aisle and rotated 180º for positioning in the work cell. Once the cart is located in the fabrication cell, the parts bin is kept at a proper ergonomic height for unloading. The operator periodically raises the lift table to an ergonomic height allowing direct loading of parts into the equipment without lifting or stretching. After each row of parts is consumed, the cart’s table is raised to pick the next row of material. The aisle between the relocated storage area and the work cell is only 30 feet wide. However, the new 13.4-ft.-long motorized cart can pivot on its center axis for great turning maneuverability. It’s also easy to steer, even with a heavy 2,500-lb. payload. The cart was also designed to be maneuvered under the bunk while fitting within the narrow space between the bunk’s supporting legs. To protect and guide the cart under the bunk, strips of Teflon-like material line the side of the cart. The custom motorized carts measure 161″L x 27″W with an 18″ lowered tabletop height, adjustable up to an ergonomic working height of approximately 36″ (and up to 53″ for servicing). The lift table itself is 26″W x 144″L. Since installing the motorized carts and modifying its raw material storage, the manufacturer has saved significant time in parts processing, and has reduced actual push/pull forces to meet its corporate requirements and reduce the risk of injury. 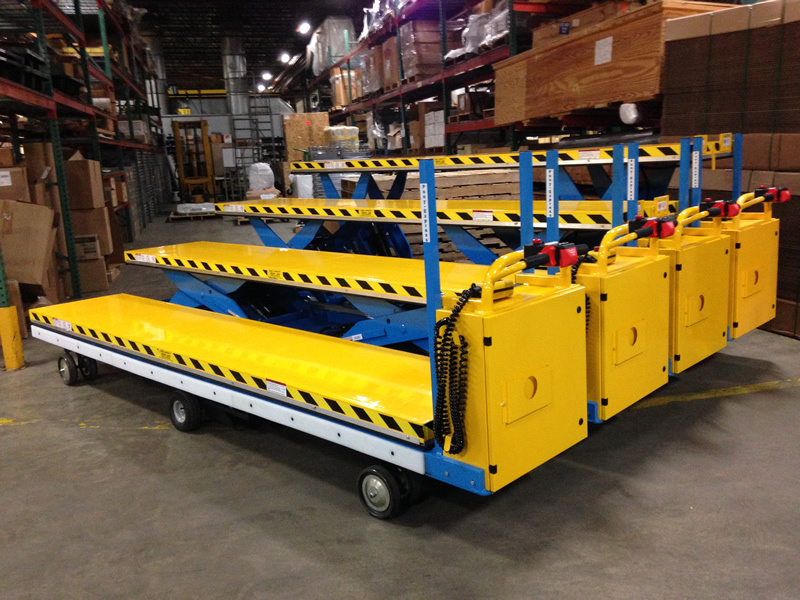 Electro Kinetic Technologies, working closely with the customer, designed and produced these motorized carts to address specific needs, as well as provided assistance in designing the parts storage bunks for improved productivity. The customer has ordered additional carts for its facility. Learn more about our Custom Carts Solutions or contact us for more information.